Einstein based his Lorentz-like Special Theory on the following false premises: 1) that the propagation velocities of light (c – v and c + v) relative to linearly moving bodies are the same phenomena as Maxwell’s constant transmission velocity of light at c relative to the medium of empty space , and 2) that a light ray must always propagate relative to a stationary body and relative to a linearly moving body at the same absolute velocity of c (300,000 km/s). But it turns out that a light ray, which transmits at the constant velocity of c relative to its medium of empty space also has a myriad of very natural relative velocities and relative distance/time intervals of propagation vis-à-vis an infinite number of linearly moving bodies in the Cosmos. Thus the paradox of Einstein’s “difficulties” concerning the velocity of light is easily explained, and there never were any real “difficulties” that needed Einstein’s absolute mathematical fix contained in his Special Theory. Let us now further scrutinize the mathematical “difficulties” that appeared to Einstein when he misapplied the mechanics principle of Galileo’s Relativity, and its related Galilean transformation equations, to a ray of light propagating relative to a stationary embankment and a linearly moving carriage (Chapter 19). With sufficient consideration and proper analysis of the phenomena and the theoretical “difficulties,” Einstein’s explainable paradox should completely disappear by the end of the next Chapter 22. In the process, we shall discover that there never were any real “difficulties;” that there never was a different transmission velocity for a ray of light en vacuo; that there never was a contradiction of Maxwell’s equations; and that there never was a need for a mathematical “modification” of Galileo’s Relativity nor for the Galilean transformation equations with respect to light. All of these paradoxical “difficulties” were merely false assumptions and/or faulty analyses that existed in Einstein’s mind, and in the collective mind of the scientific community. A. Some definitions of concepts and terms with respect to light. Neither Maxwell, nor Einstein, nor apparently anyone else has adequately defined the meaning of certain critical concepts and terms that are necessary for a clear understanding of the phenomena of light, its instantaneous emission velocity, its constant transmission velocity and its relative velocities of propagation. Therefore, we must complete this definitional task before we proceed. The following terms have the following meanings as defined by the following dictionaries. a. The word “emit” means to send out, to give forth, to eject, to give off or to transmit something, like a signal or radiation (Webster’s Dictionary). b. The word “transmit” with respect to light means “to cause…light…to pass through air or some other medium” (Ibid). c. The word “medium” means “something intermediate” or “an intervening thing through which…an effect is produced” (Ibid). In accordance with this definition, a vacuum or empty space can be a medium for light propagation. d. The word “propagate” with respect to light means to spread out or transmit through a medium in all possible directions. This definition implies that such propagation will be over distance/time intervals (Ibid). e. The word “speed” means the rate of motion or propagation: “The ratio of the distance covered…to the time taken” (Oxford Dictionary of Physics). f. The word “velocity” means “the speed…in a specified direction” (Ibid). This definition implies that the velocity will be over a distance and during a time interval. g. The word “relative” means “related each to the other” (Webster’s Dictionary). h. It follows that the term “relative velocity” means the velocity of one thing related to the velocity of another thing. i. The word “linear” means in the form or direction of a straight line (Ibid). 1. We define the “emission” of a light ray (EM radiation) to mean the instant that such light ray comes into existence and is sent out from a material light source at its point of emission in space by means of a physical process (i.e. a chemical process). 2. We define the “transmission” of a light ray to mean its abstract constant velocity, or its constant velocity relative to the medium (i.e. empty space) through which it propagates (Figure 6.8). 3. We define the “propagation velocity” of a light ray to mean its passage over changing intervals of time (duration) and over changing intervals of space (distance) relative to material bodies that are moving linearly relative to such light ray. B. Einstein was completely confused concerning Maxwell’s constant velocity of light at c.
Maxwell’s theory for the velocity of light described a ray of light which constantly transmits from its material source body through the medium of a vacuum at the velocity of c (about 300,000 km/s) (Maxwell, 1865, A Dynamical Theory of the Electromagnetic Field [The Scientific Papers of James Clerk Maxwell (1890), Vol. 1, pp. 579 – 580, Dover Publications, New York]). The velocity of c is an invariant property of a light ray transmitting through the medium of a vacuum. Maxwell’s law for the transmission velocity of light at c could also be characterized as an abstract or absolute velocity, because, unlike the velocity of a material object, it is not measured or described relative to something material. It is only theoretically measured or described relative to its medium of a vacuum …which is nothing (see our Chapter 6A). For several reasons, Einstein did not understand Maxwell’s theory for constant transmission velocity of light at c through the medium of a vacuum. Instead he assumed that the velocity of a propagating light ray was measured and described by an observer relative to a material “body of reference,” which might be moving linearly toward or away from the light ray. The primary reason that Einstein did not understand Maxwell’s theory for the velocity of light in a vacuum was mostly likely because he never read Maxwell’s above 1865 treatise. “Based upon many experiments, physicists became convinced that light propagates through empty space at a speed of c = 300,000 kilometers per second, entirely independent of the velocity of the body that emits this light. Imagine a ray of light sent by the sun in a distinct direction. According to the law just stated, this ray travels a distance of c per second. Now imagine the sun later hurls a body into space such that it flies with a velocity of 1,000 kilometers per second in the same direction as the ray of light. This is easy to imagine. We now can similarly imagine this projected body as an alternative body of reference and ask ourselves what is the propagation velocity of light in the judgment of an observer who does not sit on the sun but rather on the projected body? The answer seems simple. When the hurled body runs after the light at 1,000 kilometers per second, the ray of light advances against it by only 299,000 kilometers per second” (Ibid, pp. 3 – 4). 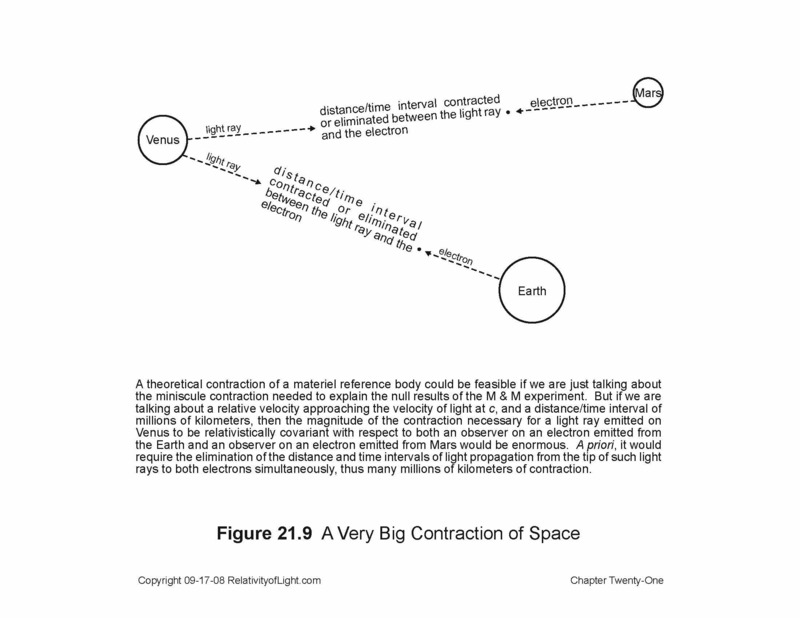 See Memo 20.1 in order to better visualize Einstein’s above thought experiment. As will be made patently clear in the following paragraphs, Einstein mistakenly believed that Maxwell’s law for the velocity of light at c in a vacuum was measured by an observer relative to a linearly moving body of reference…not relative to the medium of a vacuum. Because of such confusion, Einstein attempted in his Special Theory to defend and save Maxwell’s law for the velocity of light at c. But Maxwell’s law for the velocity of light at c, relative to its medium of a vacuum, was correct and did not need Einstein’s mistaken and artificial attempt to defend and save it. The simple answer to Einstein’s above described false premise is: Maxwell’s law for the velocity of light in a vacuum was never c (300,000 km/s) relative to a material body of reference. Maxwell’s law for the velocity of light in a vacuum was always c (300,000 km/s) relative to its medium of a vacuum. These two concepts are very different. Very importantly, the reader must fully understand the difference between these two concepts before proceeding. It is the key to realizing why Special Relativity and all of its mathematical consequences are empirically false. “Should light when judged from the projected body really propagate differently than when judged from the sun? Should the laws of the propagation of light depend upon the state of motion of the body of reference” (Ibid, p. 4)? “The law of light propagation is the same, whether the sun or the projected body is chosen as the body of reference. The same ray of light travels at 300,000 kilometers per second relative to the sun and also relative to the body projected at 1,000 kilometers per second. If this appears impossible, the reason is that the hypothesis of the absolute character of time is false. One second of time as judged from the sun is not equal to one second of time as seen from the projected body (Ibid, pp. 4 – 5). …It turns out that one can define time relative to this body of reference such that the law of the propagation of light is obeyed relative to it” (Ibid, p. 5). “Given the correct definition of time—the theorem of the constancy of the speed of light in empty space holds true. More generally, one can express as a theorem of manifold experience: the laws of nature are the same in all inertial systems. This theorem is called ‘principle of special relativity’” (Ibid, p. 6). On the contrary, the correct answers to Einstein’s above thought experiment and to his impossible conjectures with respect thereto, are as follows. 1) There is no law for the constant propagation of light at c relative to a linearly moving body of reference. Maxwell’s law for the transmission velocity of light is only a constant velocity of c with respect to the medium of a vacuum. Any moving body of reference, and the changing distance/time intervals for a ray of light propagating relative to such moving body, are irrelevant to Maxwell’s law. 2) Einstein’s ad hoc concepts concerning the absolutely constant velocity of a light ray at c relative to everything in the Cosmos at the same instant, and the variable duration of a distance/time interval…are impossible concepts. 3) We shall demonstrate in our Chapters 23 and 24 that inertial motion (and any state of motion of a material body) is completely irrelevant to Maxwell’s law for the constant velocity of light at c in the medium of a vacuum. 4) It turns out that there never was a real problem with respect to Maxwell’s law for the constant transmission velocity of light at c in a vacuum. Einstein only imagined such paradoxical problems and arbitrarily tried to fix them with mathematics. It is obvious from the above discussion that Einstein confused: 1) the changing distance/time intervals of a light ray propagating with respect to a linearly moving body of reference, with 2) Maxwell’s constant transmission velocity of a light ray at c through the medium of a vacuum. The major paradox that Einstein caused for himself and which he was grappling with in his Special Theory, was: How could the distance/time interval of a propagating light ray change relative to a linearly moving body of reference, and still maintain a constant velocity of c relative to such body? The above discussion and correct answers easily explain Einstein’s paradox. Specifically, the answer to Einstein’s above paradox is as follows: a ray of light transmits at the constant velocity of c relative to the vacuum through which it propagates, but with respect to any material body moving linearly at v through such vacuum the ray of light propagates over changing distance/time intervals relative to such moving body at the relative velocity of c ± v, depending upon the direction of motion of such body. It is just that simple. “Obviously, in this manner one can not only transform individual events but also mathematically formulated laws of nature. The principle of special relativity demands of these laws [i.e. the velocity of light at c] that they do not change under such [Lorentz] transformation. If they do not have this property, then they have to be rejected by the principle of special relativity. The laws of nature must be adapted to the principle of special relativity’” (Ibid, p. 6). On the contrary, throughout The Relativity of Light we will demonstrate that any transformation equations are completely irrelevant to Maxwell’s law for the constant transmission velocity of light at c in the medium of a vacuum. Based upon his total confusion of Maxwell’s theory of light, and based upon his above described monumental false assumptions, Einstein contrived his entire ad hoc and artificial Special Theory in order to defend Maxwell’s law, and to attempt to justify and confirm his false assumptions, his false answers and his impossible concepts. In the process Einstein applied his Lorentz transformations to many other physical phenomena (including Newton’s laws of motion) in order to imagine, interpret and invent a myriad of bizarre and spurious mathematical consequences. By now, Special Relativity and the Lorentz transformations have distorted much of physics and many other scientific disciplines as well. Not only must the laws of nature not be arbitrarily adapted to Einstein’s ad hoc principle of Special Relativity, but Einstein’s Special Relativity must be abandoned before it can further distort the laws of physics. “The velocity of light was to be constant only for an observer stationed next to the light source, whereas all observers moving relative to that source would measure a different value, depending on their own relative velocity with regard to the source” (Ibid; Figure 20.3). The above statements demonstrate that Einstein was only considering the relative velocity of a light ray as it propagated relative to its material source body, and relative to other moving bodies and observers. Whereas, Maxwell’s theories and equations concerning light only referred to light’s constant velocity of c in the abstract or relative to its medium of ether (actually empty space). In fact, Maxwell never created or discussed a theory of light relative to ponderable stationary bodies, and Einstein never referred to Maxwell’s real law for the constant transmission velocity of a light ray relative to the medium through which it propagates (Chapters 6A & 6B, and Figure 6.8). Einstein’s above described “constant emission velocity theory’” can also be characterized as a “ballistic” theory, because it assumed that the velocity of light was dependent upon the velocity of the light’s material source body (Ibid). But if the velocity of light was dependent upon the velocity v of its material source body then how could light’s velocity always have a constant value of c in a vacuum, as Maxwell’s equations and empirical experiments demand? Einstein’s attempted solution for this paradoxical “difficulty” was to postulate that: “light is always propagated in empty space with a definite velocity c which is independent of the state of motion of the emitting body.” The last part (12 words after velocity c) of such postulate was correct, as we shall further explain in Chapter 22. On the other hand, the first part of such postulate was totally incorrect, because impliedly it applies to linearly moving bodies and observers (Chapters 20F and 21D). In fact, the first part of such postulate was a major false premise and a monumental theoretical blunder upon which all of Einstein’s Special Theory was based. 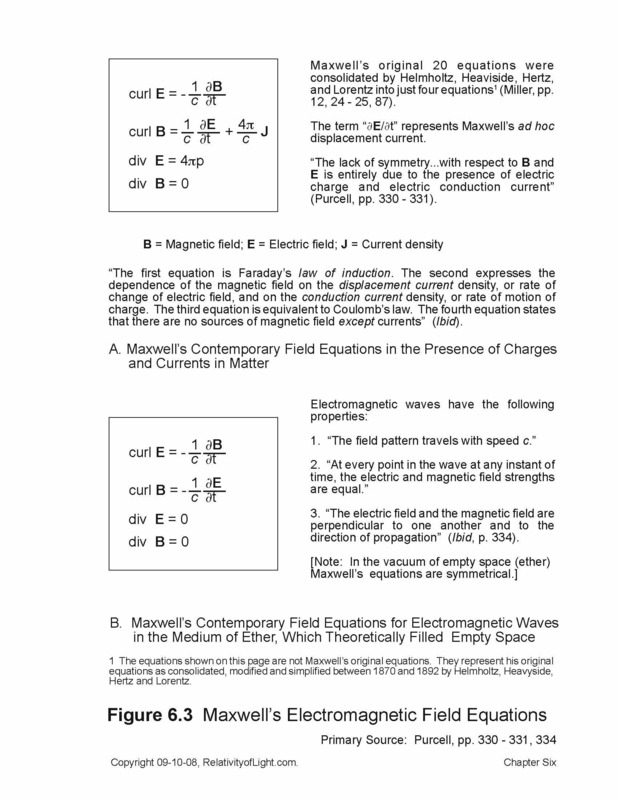 During the mid 19th century, Maxwell had assumed in his theory of light and in his equations that the phenomenon of light was an electromagnetic disturbance of the material ether, which material disturbance transmitted as electromagnetic waves at the constant velocity of c relative to its medium of stationary ether in empty space (Chapter 6A and Figure 6.3). Maxwell never theorized about the propagation velocity of such electromagnetic disturbance relative to any ponderable material body (either stationary or moving). Since Einstein was attempting to defend the validity of Maxwell’s equations, he should have postulated the following: “light is always transmitted at the constant velocity of c relative to the medium of empty space through which it propagates.” If he had, there probably never would have been any mathematical “difficulties” concerning the Galilean transformation equations that needed explaining or a mathematical fix. Everyone would have realized that a light ray transmitting at the constant velocity of c relative to its medium would very naturally also produce relative velocities of c + v or c – v when it propagated over a changing distance/time interval relative to a ponderable inertial body moving linearly at v either toward or away from such light ray. In this event, there never would have been a Special Theory of Relativity, because it would have been completely unnecessary. One thing is certain. Einstein never realized the critical distinction between the constant transmission velocity of light relative to its medium, and the varying velocities of a propagating light ray relative to linearly moving bodies. We know this, inter alia, because throughout his Special Theory and his book Relativity he repeatedly interchanged the terms “transmission” and “propagation” as if they were the same concept, because he never defined what he meant by the terms “propagation” and “transmission,” and because his examples and his theories clearly demonstrate his confusion. C. What exactly is the difference between the constant transmission velocity of a light ray at c, and the changing velocities of a light ray propagating relative to various linearly moving bodies? It is an experimental fact that the instant a light ray comes into existence, it transmits relative to the transparent medium through which it passes at a certain constant rate of velocity. The constant transmission velocity of a light ray relative to the medium of a diamond is about 38% of c (124,000 km/s); relative to the medium of glass it is about 60% of c (197,000 km/s); relative to the medium of water it is about 68% of c (226,000 km/s). Finally, the constant transmission velocity of a light ray relative to the medium of empty space (or a perfect vacuum) is 100% of c (about 300,000 km/s) (Halliday, p. 893). 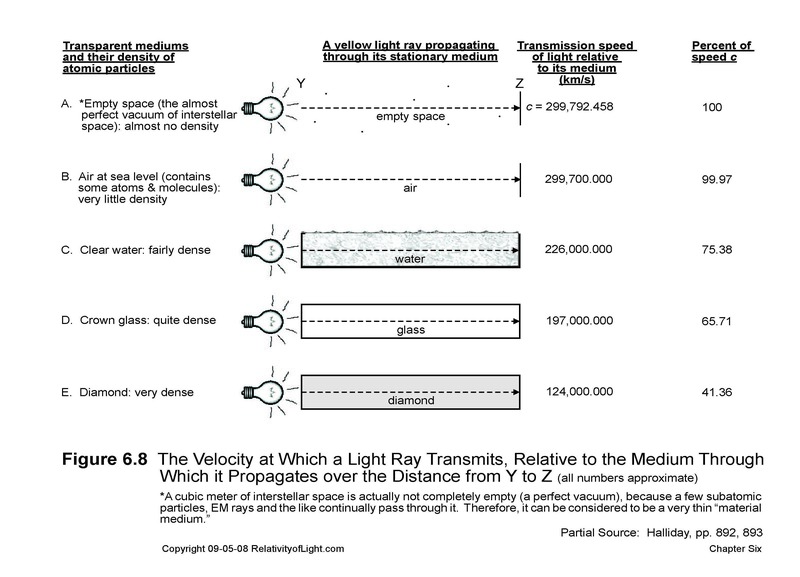 Thus, a light ray always retains the same constant rate or velocity of transmission relative to the particular transparent medium through which it propagates (Figure 6.8). This constant transmission velocity is separate, distinct and independent of any changing distance/time interval over which such light ray may propagate with respect to a ponderable material object moving linearly relative to the light ray. “Light emitted by a source, say a star…travels toward us with the speed 300,000 kilometers/second. But if the earth is moving toward the star, then relative to earth, where the light is detected, the speed of light must be greater. Similarly, if the earth moves away from the star, the speed of light reaching us must be smaller” (Sobel, p. 200). Therefore, the velocity of a light ray depends upon what it is transmitting or propagating relative to. Again, if we consider a light ray as transmitting relative to its theoretically stationary medium (say empty space), then its velocity relative to such medium will remain a constant (i.e. c). But if we consider such transmitting light ray as propagating relative to a material body which is moving linearly at v away from such light ray, then the velocity of such propagating light ray relative to such moving body will be c – v, and the velocity of such material body relative to the light ray will be v – c. Similarly, if we consider such transmitting light ray as propagating relative to a material body which is moving linearly at v toward such light ray, then the velocity of such propagating light ray relative to such moving body will be c + v, and the velocity of such material body relative to such propagating light ray will be v + c. These simple concepts do not involve anything like rocket science. The only concept that we are dealing with here is the simple concept of relative motions (velocities). D. A light ray, which always transmits at the constant abstract velocity of c relative to its medium of empty space, also has relative velocities of c ± v and relative distance/time intervals of ct ± vt when it propagates toward or away from material bodies that are moving linearly at v with respect to such light ray. “The velocity of propagation of a ray of light relative to the carriage thus comes out smaller than c…But…like every other general law of nature, the law of the transmission of light in vacuo must, according to the principle of relativity, be the same for the railway carriage as reference body, as when the rails are the body of reference. But, from our above consideration this would appear to be impossible. “If every ray of light is propagated relative to the embankment with the velocity c, then for this reason it would appear that another law of propagation of light must necessarily hold with respect to the carriage—a result contradictory to the principle of relativity” (Einstein, Relativity, pp. 22 – 23). Here Einstein was interchanging and confusing Maxwell’s concept of “the constant transmission velocity of light at c relative to its medium of ether (empty space)” and the concept of “varied velocities of a light ray relative to material bodies moving linearly at velocity v relative to the light ray”…as though they were the same concept. However, they are obviously two completely different concepts, as we explained in the last Section C. The “principle of relativity” that Einstein was referring to was not Galileo’s empirical concept of relativity, but rather Einstein’s own ad hoc, expanded and invalid mathematical concept of relativity and algebraic co-variance (Chapter 20E). A correct statement by Einstein would have been: “Maxwell’s natural law of the constant transmission velocity of light atc relative to the medium of empty space must be the same with respect to every linearly moving material body (and observer). Einstein obviously misinterpreted the varying velocities of a light ray propagating relative to the stationary embankment and propagating over changing distances and time intervals relative to linearly moving bodies with different speeds of v, to be different transmission velocities for the same light ray. Whereas, in actuality, such varying velocities (of c + v and c – v) are only the very natural different relative velocities of a light ray (transmitting at cand) propagating over changing distance intervals during changing time intervals…toward or away from material bodies moving linearly at different speeds and in different directions relative to the light ray (Figure 21.1). Such relative velocities were also the natural result of applying the Galilean transformation equations to a light ray propagating between two different reference frames (the stationary embankment and the carriage moving away from it at v). Such relative velocities do not (and cannot) change Maxwell’s natural law for constant transmission velocity of such light ray at c relative to its medium of empty space, or relative to any other transparent medium (including air) at a lesser constant velocity. Einstein and the scientific community apparently failed to realize that when the tip of such light ray (transmitting at c relative to its medium) is propagating among various linearly moving material objects, that each moving object has a different velocity and a particular direction of motion, and thus experiences a different distance/time interval of approach or separation relative to the tip of such light ray; and vice-versa (or reciprocally) for the light ray. 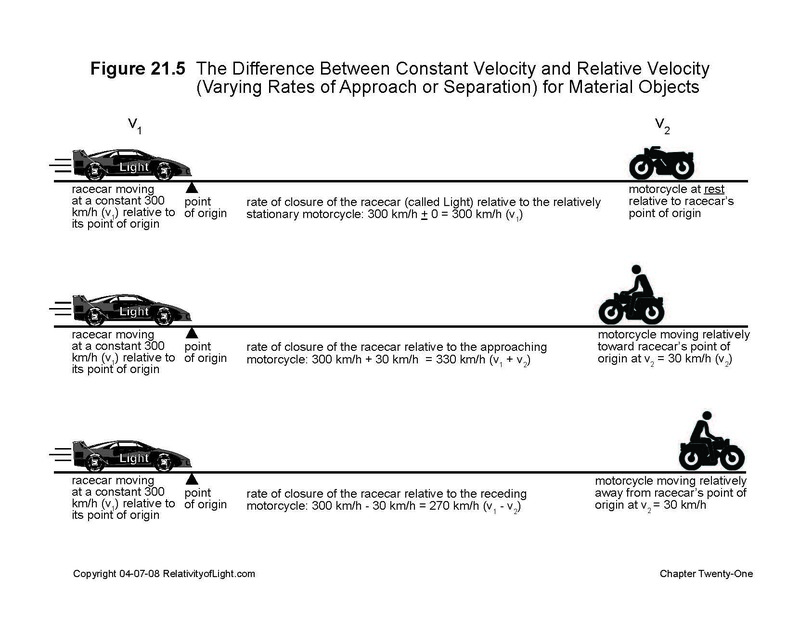 In other words, these different velocities and different directions of motion of material bodies each create a different relative velocity between the tip of such light ray and each linearly moving material object or other ray of light (Figure 21.3 and Memo 21.4). Each of these relative velocities could be described as c – v or c + v depending upon each object’s velocity and relative direction of motion. But none of these relative velocities have any effect upon the constant, abstract and invariant transmission velocity of the light ray at c relative to its transparent medium. Light always propagates relative to its medium of empty space at the transmission velocity of c, regardless of the relative motions of material objects around it. Figure 21.3 and Memo 21.4 demonstrate some of the various relative velocities that exist for the propagation of light rays with regard to differently moving material objects and relative to other rays of light. 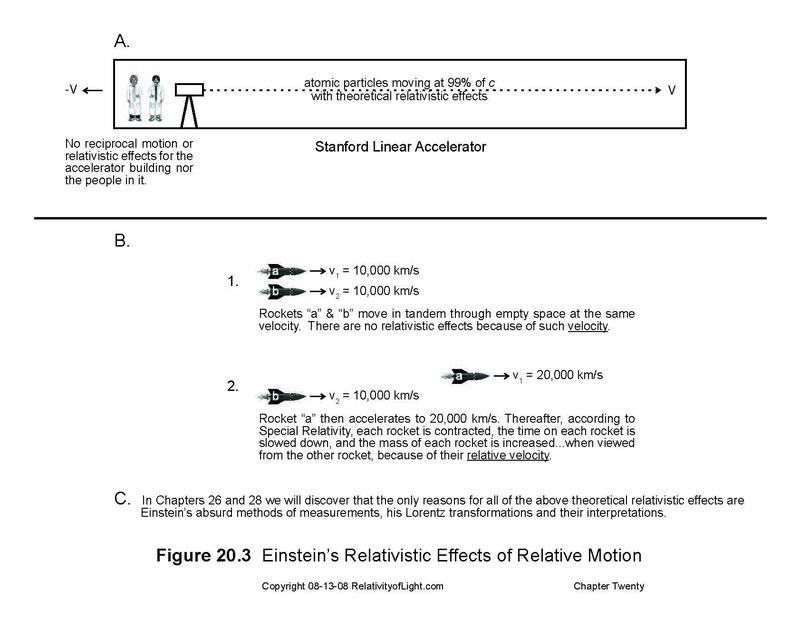 As the reader can readily see on Figure 21.3, the tip of Einstein’s light ray (L1) is propagating relative to the linearly moving railway carriage A at 300,000,000 meters/s minus v = 30 meters/s. But this comparative or relative velocity (c – v) does not in any way affect or change the transmission velocity of the light ray (L1) at c = 300,000,000 meters/s relative to the medium of space through which it passes. All four light rays shown on Figure 21.3 maintain their constant transmission velocity of c through the medium of empty space, and yet their relative velocities (of propagation) vis-à-vis different linearly moving material objects and other rays of light also vary widely (Memo 21.4). Very importantly, the same type of relative velocities holds true with respect to all material objects and observers moving linearly relative to each other (Figures 7.1, 21.5 and 21.6). As Neffe concludes with respect to the above: “Light acts like any traveler who moves at a constant rate of speed” (Neffe, p. 128). Now if these different relative velocities of propagation (c – v or c + v) are misinterpreted to be different velocities of transmission for the same ray of light, then a “difficulty” or paradox is created. Again, this is what Einstein concluded in his example of the “difficulties.” Einstein misinterpreted the propagation velocity of the tip of a light ray, relative to the linearly moving carriage at v, to be a different transmission velocity (c – v) for the light ray. But, in fact, he was only measuring and referring to the very natural relative velocities between the tip of the light ray and other linearly moving things in its neighborhood. When Einstein asked for the velocity of the ray of light (w) relative to the linearly moving carriage (Einstein, Relativity, p. 22), he was not even dealing with an addition of velocities (Figure 19.1B). Rather, he was only dealing with a very natural comparative or relative velocity, vis. the transmission velocity of the light ray at c compared to the linear velocity of the carriage at v in the same direction. So, Einstein got exactly what he was asking for: a relative velocity (c – v). But he obviously did not realize nor understand the concept of the Relativity of Light. Thus, the paradox of Einstein’s “difficulties” is easily explained. There never were any real “difficulties” between Galileo’s Relativity or the Galilean transformation equations and Maxwell’s constant transmission velocity of light at c (mathematical or otherwise) that needed fixing, which needed mathematical reconciliation, or which needed Einstein’s contrived Special Theory. ; The principle of Galileo’s Relativity and its related Galilean transformation equations may be valid and meaningful for mechanics, but they are both irrelevant with respect to the laws of electromagnetic waves of radiation (light) (Chapters 23 and 24). Maxwell’s law for the transmission velocity for a light ray at c is both a constant (invariant) property of the light ray with respect to its medium, and results in different relative velocities when such light ray propagates with respect to material bodies that move linearly through space with changing distance/time intervals relative to such light ray. This situation is identical with respect to material objects moving linearly with respect to each other, such as automobiles traveling down a motorway at different constant speeds, and in different directions (Figure 21.6). E. Einstein’s impossible absolutely constant velocity of a light ray at c relative to everything. Einstein’s failure to understand the difference between the constant abstract transmission velocity of a light ray at c relative to its medium of empty space, and the varying relative velocities of a light ray propagating with respect to linearly moving material bodies (the “Relativity of Light”), led to his next major false premise: that a light ray en vacuo always propagates at the absolutely constant velocity of c relative to everything. More specifically, the first part of Einstein’s second postulate (that “light is always propagated in empty space with a definite velocity c”) means that a ray of light propagates over changing distance/time intervals relative to different inertial bodies (coordinate systems or frames of reference) at the same absolutely constant coordinate velocity of c and at the same instant of time, regardless of the different linear velocities of such inertial bodies relative to such light ray. This type of absolute velocity is, of course, an impossible concept. As we have already pointed out in Chapter 20F, many scientists have similarly interpreted the first part of Einstein’s second fundamental postulate. Typically, Bohm interpreted it to mean that: “all uniformly moving…observers obtain the same measured velocity of light, independently of their own speeds” (Bohm, pp. 54, 60). Resnick interpreted it to mean: “the speed of light in free space has the same [measured] value c in all inertial reference frames” (Resnick, 1992, p. 469). Dingle interpreted it to mean: “velocity with respect to anything at all” (Dingle, 1961, p. 20). “We are at once on the horns of a dilemma. Either we must give up relativity…or we must overturn the foundations of common sense by admitting…that when we go to meet an advancing light-impulse, or when we retreat from it, it still reaches us with the same velocity [c] as though we stood still waiting for it” (Ibid). “The velocity of propagation of a ray of light relative to the carriage thus comes out smaller than c…But…like every other general law of nature, the law of the transmission of light in vacuo must, according to the principle of relativity, be the same for the railway carriage as reference body, as when the rails are the body of reference. But, from our above consideration this would appear to be impossible. If every ray of light is propagated relative to the embankment with the velocity c, then for this reason it would appear that another law of propagation of light must necessarily hold with respect to the carriage—a result contradictory to the principle of relativity” (Einstein, Relativity, pp. 22 – 23). Einstein then referred to this paradox that he had created as a “dilemma” (Ibid, p. 23). “How have we to modify [the Galilean transformation equations so] that…every ray of light possesses the velocity of transmission c relative to the embankment and relative to the train (Ibid, pp. 34, 35). “Can we conceive of a relation between place and time of the individual events relative to both reference-bodies, such that every ray of light possesses the velocity of transmission c relative to the embankment and relative to the train” (Ibid, p. 35). Both of such questions by Einstein vividly illustrate the impossible absolute velocity of c that he was trying to mathematically create with the first part of his second postulate. 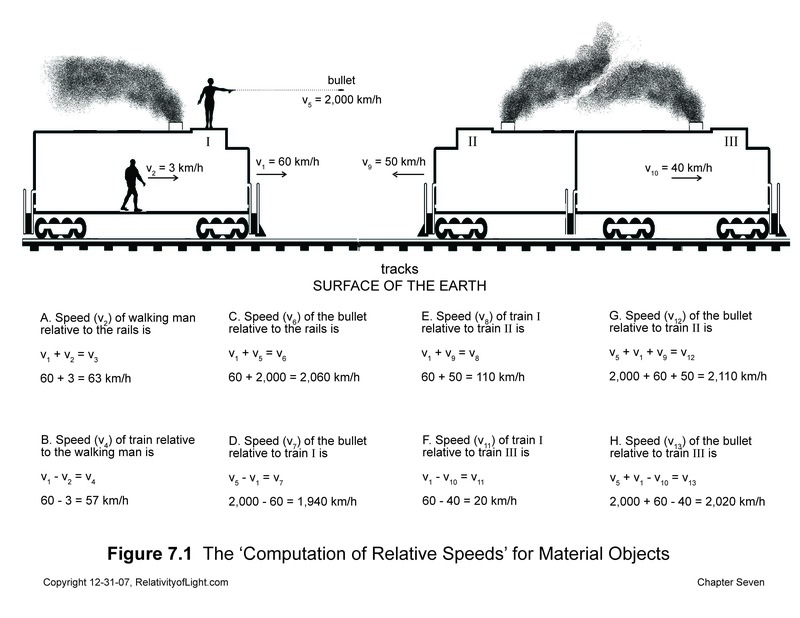 However, it is physically and empirically impossible for anything…the Earth, a railway carriage, an automobile, a rocket, or a ray of light…to travel or propagate at a constant speed over different distances during the same interval of time (Figure 21.7). Nevertheless, this is what Einstein was asserting. 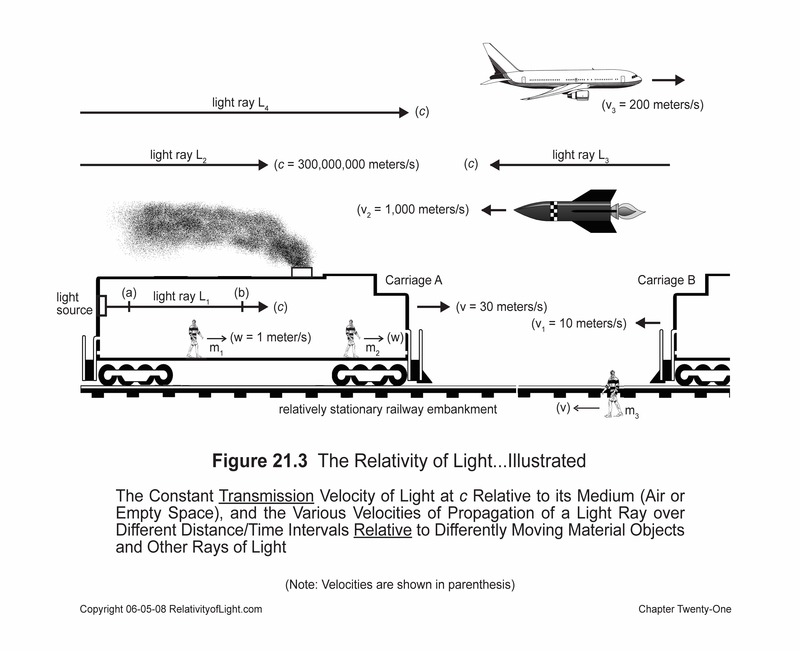 If Einstein had realized that every ray of light was already constantly transmitting at velocity c relative to its medium of empty space, then he also would have realized that that such light ray would be transmitting at velocity c when it was at the position of the embankment or the train. Therefore, his proposed modification of the Galilean transformations and his proposed relation between place and time (which relation turned out to be the Lorentz transformations) would have been completely unnecessary in order to resolve the paradoxes (difficulties) which Einstein created and perceived. 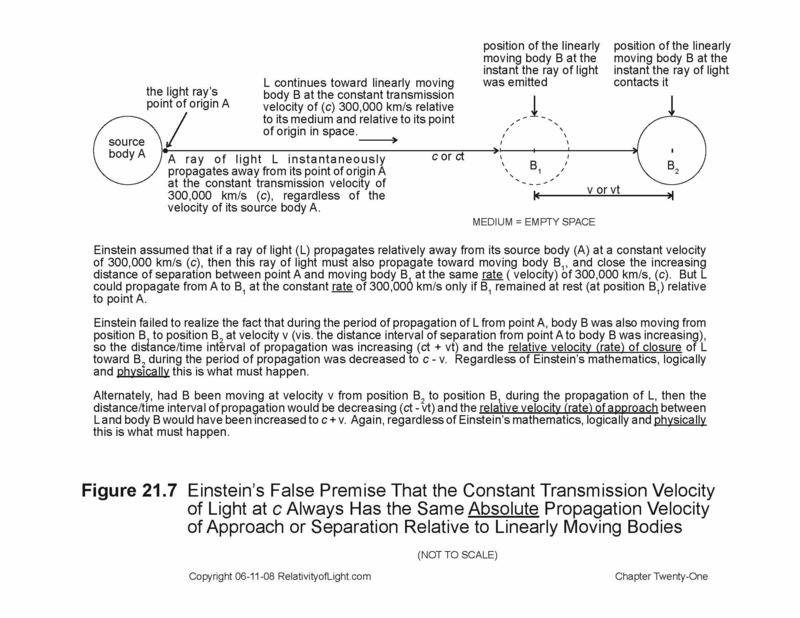 The relation that Einstein was referring to on the above page 35 of Relativity was of course his radical Lorentz transformation equations, which (depending upon the magnitude of v) can mathematically cause any light ray to propagate at the absolutely constant velocity of c over any changing distance/time intervals relative to all linearly moving inertial observers in the Cosmos at the same instant of time, regardless of their different linear velocities v relative to the light ray (Einstein, Relativity, pp. 36 – 39; Russell, p. 49). This artificial result served to achieve Einstein’s algebraic concept of “co-variance” (Chapter 20E), which his first postulate and his “theory of relativity demands of a natural law” (Einstein, Relativity, p. 48). This artificial mathematical result also demonstrates that the first part of Einstein’s second postulate is really just a mathematical consequence of his first postulate: his co-variant “principle of relativity.” Such absolute velocity of light result was also Einstein’s primary goal for his Special Theory, because it mathematically solved the various “difficulties” that he imagined (Chapter 19). 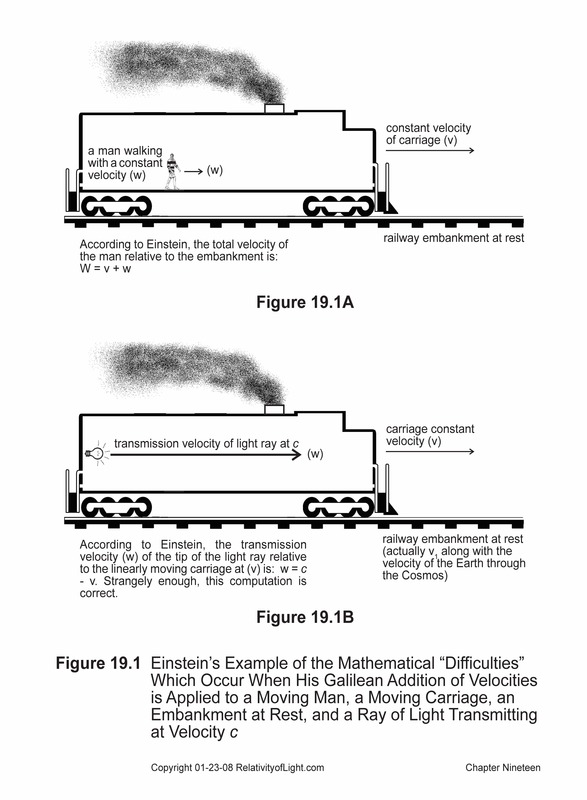 It is obvious from the above that Einstein was attempting to mathematically negate or eliminate the relative velocity of light “c ± v ” with regard to the moving train, to mathematically eliminate the relative distance/time intervals of light ct ± vt with regard to the moving train, and was attempting to mathematically replace them with a concept that would provide an absolute velocity for light, which a priori did not depend upon the linear motion of the train. 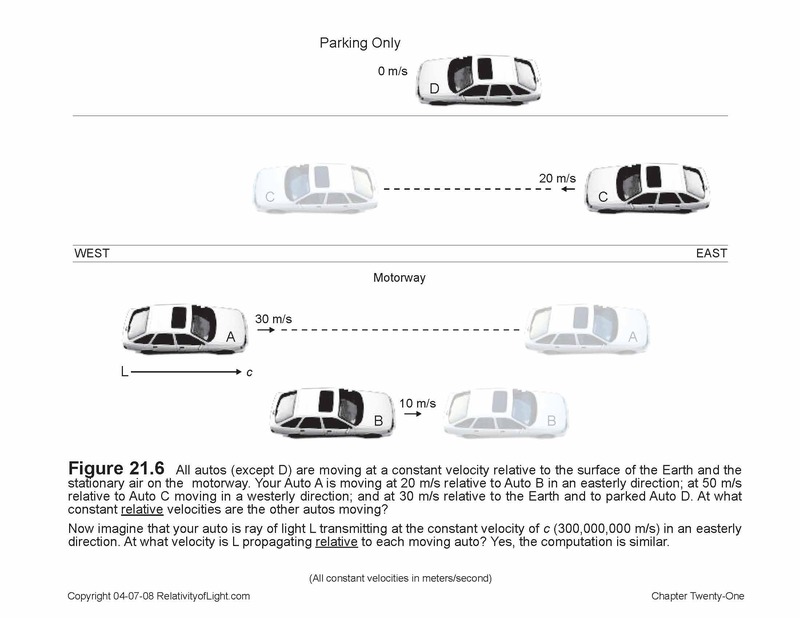 For how other than absolutely or instantaneously can anything, even a ray of light, move at an absolutely constant velocity relative to a stationary object and relative to an object that is approaching or moving away…all at the same rate of speed and at the same instant of time (Figure 21.7). By applying the Lorentz transformations to the relative velocity of a light ray propagating over changing distance/time intervals with respect to the stationary coordinate system of the embankment (frame of reference) and with respect to the linearly moving coordinate system of the carriage (frame of reference), Einstein mathematically did away with the troublesome relative coordinate velocities of c – v and c + v so that such light ray could algebraically propagate relative to both coordinate systems (frames of reference) at the same absolutely constant coordinate velocity of c at the same instant of time, regardless of the different linear velocities (v + c or v – c) of such frames of reference (coordinate systems) relative to such light ray abstractly transmitting at velocity c (Einstein, Relativity, pp. 47 – 48). One can only speculate as to why Einstein invented a new, ad hoc, totally incorrect and unnecessary postulate for the velocity of light en vacuo. Perhaps Einstein only knew about or only studied Maxwell’s equations as modified by Hertz when he read Föppl’s book in 1902, but failed to read Maxwell’s original theories concerning light, which described light as a disturbance of the ether transmitting at velocity c relative to its medium of stationary ether in empty space (Chapter 6A). If Einstein had not studied Maxwell’s original theories concerning light, he would have been completely confused by Maxwell’s equations, which only refer to velocity c in the abstract. Perhaps the light experiments of Bradley, Arago and Fizeau confused Einstein. They, in effect, concluded that the velocity of light has the same value for every inertially moving body (frame of reference) regardless of its own different velocity in opposite directions (Chapters 7 and 19). Perhaps it was the M & M experiment with all of its paradoxical conclusions that confused Einstein (Chapters 9 – 12). Perhaps Einstein was misled by all of the false ether theories, such as those of Lorentz and Poincaré, and the other absurd theories of the late 19th century. Perhaps when the material ether was exposed to be a fiction by Michelson in 1881, Einstein could think of no other material medium with respect to which light could transmit, so he decided that it must transmit and propagate at c relative to ponderable material bodies. Perhaps the concept of light transmitting relative to its medium of empty space (in the absence of ether) was too abstract a concept for his mathematical sensibilities to digest. We will probably never know for sure the real reason for Einstein’s confusions. 2) If the distance and time intervals which the light had to propagate relative to moving objects could somehow respectively be contracted and dilated (or eliminated) in proportion to the relative linear velocity v of the moving object (Figure 21.8). The first absolute method was untenable for Einstein as a direct solution, because numerous experiments had already empirically demonstrated that the velocity of light was finite and approximately 300,000 km/s, which was in accord with Maxwell’s equations. So Einstein was forced to choose the second method as an indirect absolute solution. “[T]he Lorentz transformation has the advantage that it makes the velocity of light the same with respect to any two bodies which are moving uniformly relatively to each other, and, more generally, that it makes the laws of electromagnetic phenomena (Maxwell’s equations) the same with respect to any two such bodies. It was for the sake of this advantage that it was originally introduced” (Russell, 1927, p. 49). “Now it is obvious at first sight that if our space and time measurements were such as classical science believed them to be, it would be impossible for a ray of light to pass us with the same speed regardless of whether we were rushing towards it or fleeing away from it. A simple mathematical calculation shows us, however, that we can make our results of measurement compatible with [Einstein’s] postulate of invariance provided we recognize that our space and time measurements are slightly different from what classical science had assumed…It leads us, of course, to the Lorentz-Einstein transformations, and from these transformations it is easy to see that rods in relative motion must be shortened, durations of phenomena extended and the simultaneity of spatially separated events disrupted” (D’Abro, 1950, p. 162). 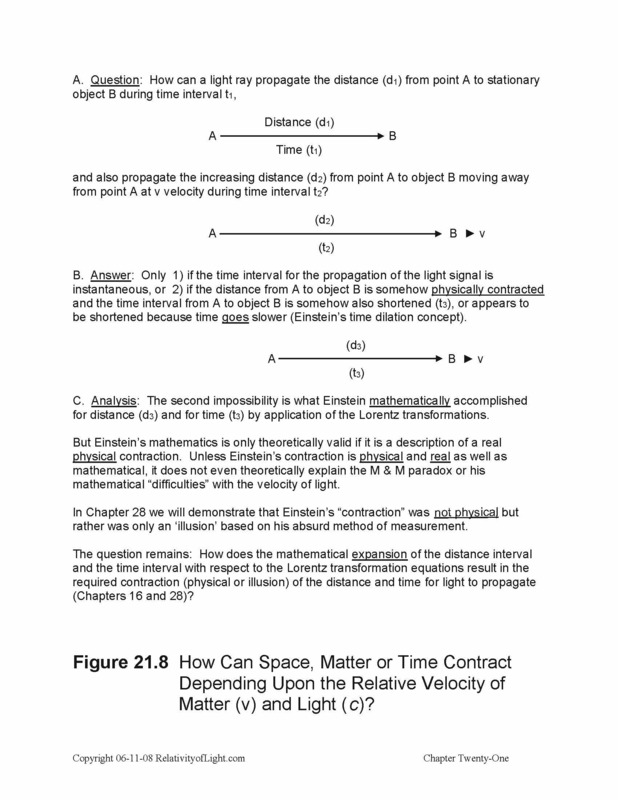 These artificial and meaningless concepts of space and time measurement described by D’Abro are what Einstein mathematically accomplished in the first and second parts of his Special Theory, initially by contrived and illogical persuasion and then by the Lorentz transformations, all in a futile effort to justify his impossible absolute velocity of light at c (Chapters 20G and 25 through 29). For this indirect method of contrived and distorted measurements, Einstein needed the mathematical version of Galileo’s Relativity, with Lange’s inertial reference frames, with its coordinates, with its relative velocities, and with its Galilean transformation equations, so that he could theoretically and mathematically modify such distance/time intervals. Thus, it was critical for Einstein’s Special Theory that the Galilean transformation equations for distance and time be theoretically applied to c, regardless of any incompatibility, irrelevance, and irreconcilability between Galileo’s Relativity and the velocity of light (Chapters 19, 23 and 24). This is the reason why Einstein would insist on inserting a square peg (the velocity of light) into a round hole (Galileo’s Relativity). “[T]he law of the transmission of light in vacuo is satisfied for both the reference body K [the stationary embankment] and for the reference body K′ [the moving railway carriage]. A light signal is sent along the positive x-axis, and this light-stimulus advances…with the velocity c ”  (Ibid, p. 38). But there is a problem even with this mathematical concept. The Lorentz transformation for distance on its face was designed to make the numerator (i.e. the space or distance, x ± vt, between two inertial frames) mathematically expand (Chapters 16 and 28). Even if somehow the distance between two things in space is then interpreted to contract, this means that at high relative velocities, empty space itself must contract (Figures 21.8 and 21.9). Since empty space is nothing, how can nothing contract…to less nothing? Does any part of Einstein’s Special Theory make any empirical or logical sense? The answer is No. Little did Einstein realize that he had just invented an ad hoc, contrived, complicated, absolute and impossible mathematical solution for an imaginary problem that physically, empirically, logically, and theoretically does not exist (Chapters 21C and 21D). In the process, he created an impossible absolute velocity for the propagation of light, which also cannot and does not exist (Chapter 21E). We have now discussed the “difficulties” that Einstein perceived, including the M & M paradox, and the fact that such “difficulties” did not even exist. We have discussed why Einstein needed to construct his Special Theory around the framework of Lange’s mathematical model of Galileo’s Relativity. We have discussed in general terms Einstein’s false analogies, his false premises and his proposed absolute solution for the “difficulties” that he perceived. We have also demonstrated that the first part of Einstein’s second fundamental postulate with respect to the absolutely constant velocity of light at c is invalid and meaningless. In light of the above, how can Special Relativity have any meaning or any validity for anything? In Chapter 22 we will discuss how and why light really transmits and propagates. In Chapter 23 we will further discuss how and why the concepts of matter and any form of relativity are irrelevant to, and irreconcilable with, the velocity of light. Then in Chapter 24 we will demonstrate why Einstein’s radical Principle of Relativity was invalid with respect to light, and irrelevant to the transmission velocity of light at c and to the propagation velocity of light relative to linearly moving objects. Thereafter, in Chapters 25 through 29, we will analyze and discuss the specific means by which Einstein attempted to mathematically achieve his ad hoc and absolute solutions.